As of August 2014, the Green River Bridge on Tebbs Bend Road is closed. A new bridge will be constructed in 2015. Driving Tour Stops 1-3 can be viewed on Tebbs Bend Road from its North Entrance off Highway 55. Tour Stops 4-11, including the Civil War Monument, can be viewed from the South Entrance to Tebbs Bend Road off KY Highway 55. The battle of Tebbs Bend was "one of the most outstanding small victories in the Civil War. It was unusual for a small Union force to resist Morgan, and to fight so fiercely and effectively," observed historian James Ramage. In this brief encounter, a small force of untested recruits of Moore's 25th Michigan repelled repeated assaults by 800-1000 battle-hardened and confident dismounted cavalrymen from Duke's and Johnson's brigades. The battle, which lasted under four hours, is regarded as one of the bloodiest of the war in the Western Theater, even though relatively small numbers were involved, with the Rebels suffering by far the most casualties, losing twenty experienced officers which included a colonel, a major, four captains, and nine lieutenants. Morgan's decision to make a frontal attack against an entrenched and fortified enemy position, which could have been bypassed, was uncharacteristic and opposed by his senior commanders, D. Howard Smith and Adam R. Johnson. Morgan considered his troops invincible. He also underestimated the strength of his enemy's defensive position, the difficulty of the terrain, and the quality of Moore's leadership. Morgan’s resolve to continue the assault while withdrawing his artillery after many of its gunners had been shot by Union snipers from the rifle pit, seems a more doubtful, even rash decision. Hockersmith commented that Morgan's decision to fight this battle was "one of the few, very few mistakes that were made by General Morgan during his whole military career." Faulty Confederate intelligence concerning the terrain leading up to and surrounding the Union main defensive position on high ground, flanked by steep bluffs may have been a factor in Morgan’s defeat. On the Union left, the bluff could not be scaled, and on the right it could only be climbed with great difficulty. His experienced and trusted chief scouts, Quirk and Cassell, had been wounded just prior to the battle, and it was the first day for Tom Franks to be in charge. Colonel Smith recorded that a scouting party had been sent out by Morgan the night before, but its report must have been unconvincing. The fact that he sent Colonel Tucker forward to reconnoiter the Union defenses on the early morning of July 4 indicates that Morgan was uncertain about what his men would face. In spite of his limited battle experience and almost no engineering background, Moore’s preparations for the upcoming battle were meticulous and complete. 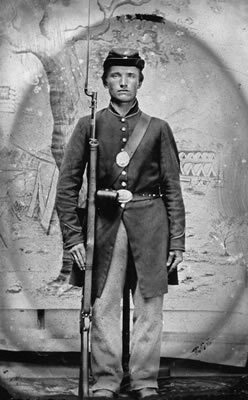 He also took great care to keep information from the Confederates and to create the impression that his force was much stronger than it was. He stopped all civilian traffic on the road to the bridge and nearby fords. Even the few people living in the area knew little about the defense works Moore's men were erecting. They had only heard the ringing of axes. Moore had, however, observed the importance of defended positions out West and at Munfordville, and the 25thMichigan had gained some experience digging in when an attack was anticipated at Munfordville. Asa and Chester Slayton of Company B built fortifications there and probably passed on information about this in conversations around the campfire. In addition to their good training, there is another element that helped the Michigan men fight: many were imbued with a sense of great patriotism and of "doing God's duty." The religious upbringing is evident in the letters of the men, particularly Company I, the Dutch regiment. "It is clearly seen that God fought for us. I see a higher hand in it because that is the first time John Morgan1s been beaten so badly," wrote Wilterdink, a devout soldier." Van Lente thanked God for delivering then from death, as He had at Green River. Moore has been credited with delaying Morgan thirty hours and giving Louisville time to prepare its defenses. Since Morgan had already planned to meet Hines' squad at Brandenburg and had scouted the river crossing there, apparently he never seriously intended to attack Louisville. However, he wanted Union forces to believe that he was coming there. General Morgan hoped for Moore’s surrender at Tebbs Bend, the capture and parole of his men, and a march to Lebanon by early afternoon of July 4. Instead, the rearguard of his battered force did not leave Campbellsville until dusk and rode long into the night to reach New Market. This site demonstrates how crucial it is in battle to occupy the ground that dominates the surrounding terrain with fields of fire covering enemy approaches. The Northern forces, well dug in and protected by an abatis and the steep banks of Green River on both flanks, defeated the much superior Southern force with artillery, losing only six that day. It was an axiom in the Civil War that to capture a strong defensive position one needed at least 3 to 4 odds. In this case, Morgan had 4 or 5 to 1. It was a brilliant victory, indeed.